“Dorit Cypis uses performative strategies, photography, and social sculpture to explore the psycho-physical-social aspects of history, knowledge and experience. 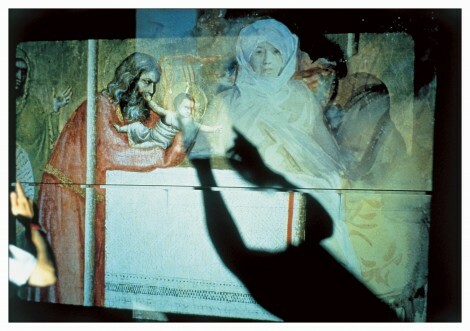 Cypis’ presentations are often immersive laboratories abstracting form and meaning to expose paradox and possibility. Her work has been presented at the Whitney Museum of American Art, International Center of Photography, San Francisco Museum of Modern Art, Orange County Museum, Walker Art Center, Musee d’Art Contemporain/Montreal, Musee des Beaux Arts/Bruxelles, Los Angeles County Museum of Art, and the Orange County Museum of Art, in addition to international galleries and artist spaces. Cypis has taught on identity, representation, social relations, and conflict transformation at universities and colleges across the USA, as well as in Canada, Holland, France, Switzerland, and Israel. Cypis has been instrumental in designing public programs including Kulture Klub Collaborative, Minneapolis, 1992-1998, artists working with homeless youth to develop their capacity for creative expression, and Foundation for Art Resources, Los Angeles, 1979-1982, assisting artists to work collectively and to situate art in the public domain. Cypis founded Foreign Exchanges in 2007, developing tools of engagement across personal and cultural differences. She is a founding member of Mediators Beyond Borders and recent Chair of the Middle East Initiative of Mediators Beyond Borders. در سال 2002، من به کار با موزه همر، دوباره دعوت شد. خیلی هیجان زده بودم. علاوه بر گالری های بین المللی و فضاهای هنرمند. واسطه فراتر از مرزها و صندلی های اخیر از طرح شرق میانه از واسطه فراتر از مرزها است.